I thought that today would be the perfect time to introduce you to Heather and to share some wonderful back to school baking ideas! Heather is my amazing cupcake friend and I have loved getting to know her over this past year or so. Make sure you watch her video because it explains everything perfectly and she has the cutest table setup! Enjoy! Hey Everyone!!! Heather here from Pirates-n-Princesses and I am beyond excited to be guest blogging today on one of my FAVORITE go-to recipe blogs! 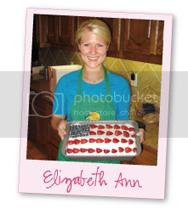 I first found Elizabeth when she guest blogged over on Party Box Design and quickly learned we shared a lot in common, especially our love for a yummy cupcake! It has been so fun getting to know her since then and I love her to pieces, I just wish we lived closer!!!! Yesterday I had the pleasure of going on the Morning Show on WCFN to share some cute back to school ideas and cupcakes. In case you missed it, click HERE to watch the clip. I found the idea for the pencil vase over on Shindig Parties TO GO. It was super EASY and turned out really cute. To see a tutorial, you can get all the details over on Shindig's blog HERE. Can you really go wrong with oreos and melted chocolate? I found this idea via Shindig's blog, too! To see a tutorial on how to make these you can find it HERE. She also has some FREE back to school printables you can download, too! I found these cute cupcake liners and toppers at Williams-Sonoma. These "I'm So Lucky to Have You" tags are so cute! I found them via The Girls at Eighteen25. You can download your FREE set HERE. For the high lighters, I found this cute tag that says, You are the Hi-Lite of my day! Super cute and what teacher can't use some new high lighters? To get your FREE printable, head over to One Charming Party's blog HERE. Thanks for sharing these amazing ideas with us, Heather! And ironically, the winner of the Stella and Dot earrings is Number 22. . . Heather! I started laughing out loud when I realized who 22 was! :-) Thanks everyone for entering! OH.MY.GOODNESS!!!!! I can't believe I won!!! How exciting!!!!!! And thanks so much for letting me guest blog today! LOVE, LOVE, LOVE your blog!! !